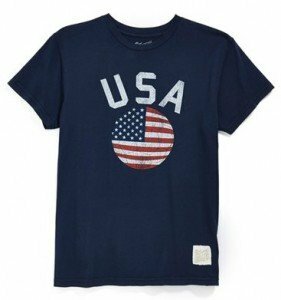 Do NOT buy an American Flag T-shirt to wear on the 4th of July with a “Made in China” tag on it. Do NOT do it. Just, don't. M'kay? 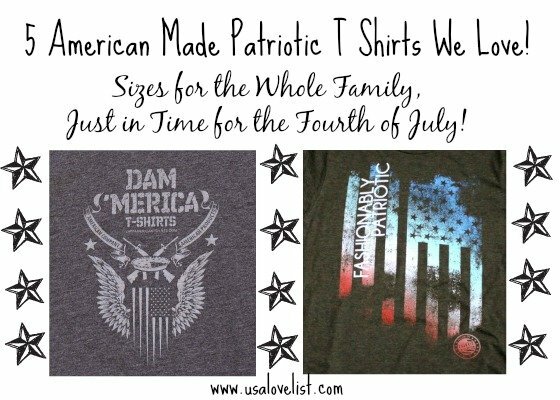 Just in time for the Fourth of July, the editors at USA Love List have put together a collection of American made patriotic T shirts that we love! With men's, women's, and children's sizes all covered, you are bound to find a patriotic style for everyone in the family! 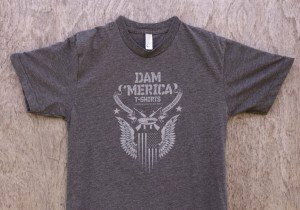 Dam ‘Merica is a Veteran owned T-shirt company based in Georgia. Peter Dam's first T-shirt design started from a silly drawing he made after a few inches of snow fell in Georgia. Little did he know that his “Snowpocalypse '14 Survivor” T shirt would become an instant hit! 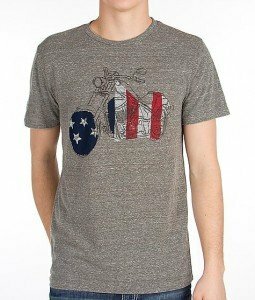 The gray T shirt pictured above is the Dam ‘Merica popular “Brand” T-shirt. 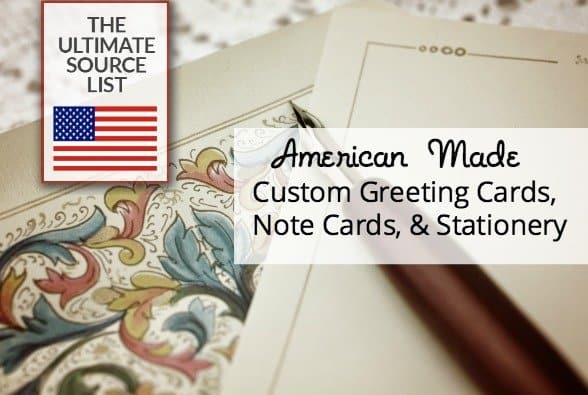 ‘American Company, American Products' are words Peter proudly includes in this design as he makes sure that all only American made T-shirts carry his designs. And really, what's more American than apple pie, rifles, and Old Glory with the wings of an eagle?! 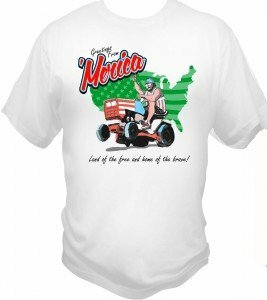 The white “Greetings from ‘Merica” T shirt is a brand new design that will soon be available for pre-order. Make sure to get one of these before they sell out! 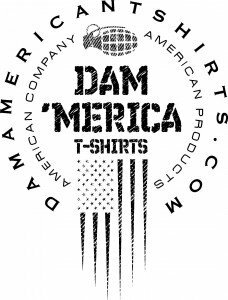 Dam ‘Merica T-shirts are available in mens sizes and are printed on American Apparel, or Anvil American Line. I have the Small and it fits me perfectly, even after many washes. 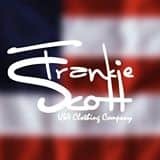 At Frankie Scott USA Clothing Company it is believed that patriotic clothing should be worn EVERY DAY, not just on holidays. 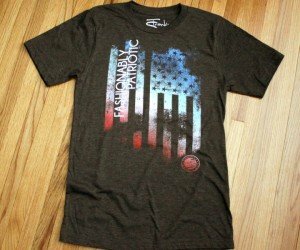 Named after Frances Scott Key, the author of the Star Spangled Banner, Frankie Scott American made T shirts, tanks and, hoodies are of high quality and aim to be “fashionably patriotic”. You will WANT to wear these stylish T shirts all year long! 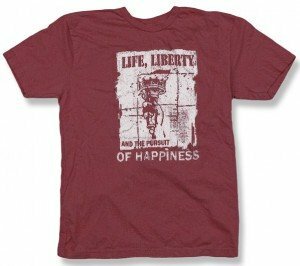 Frankie Scott USA Clothing Company is a company that gives back. A $1 from every item purchased through the Frankie Scott website is donated to the Folds of Honor Foundation, a non profit organization that, through scholarships and other ways, assists the children and spouses of soldiers who were killed our disabled in service. Frankie Scott clothing is available in ladies and unisex sizes. The Original Retro Brand T-shirt company has been manufacturing T shirts in the USA, Los Angeles, California to be exact, since 1962. The Original Retro Brand company strives to re-create the look, feel and fit of the T shirts of the past. With many classic college, sports, pop culture, beer and, of course, patriotic designs to choose from, in both women's and men's sizes, it's hard to not buy several! Some styles are available in boys sizes. I have the USA shirt (not only patriotic, but perfect Soccer World Cup wearing attire!) pictured above in white in a women's size Medium and it fits snuggly. I also have a Captain America T-shirt in a mens' Medium which fits me loosely. USA Love List first introduced The Red, The White, The Blue to our readers back in 2012 when we featured their ladies' “After the Party” Presidential election themed T shirt. Manufactured in California, The Red, The White The Blue offers unique patriotic themed designs in mens sizes as well. 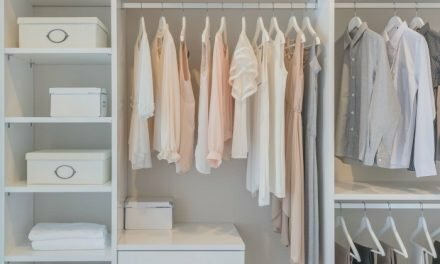 Hank Player is another USA Love List brand favorite. Hank Player T shirts are manufactured in the USA and are available in sizes for the whole family. The patriotic T shirt above is available in children's sizes.